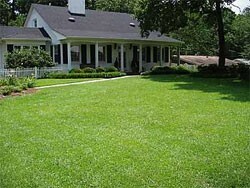 This article will teach you how to maintain a Centipede grass lawn. This calendar of suggested management practices is designed as a guideline to assist lawn care professionals and homeowners in the maintenance of a Centipede grass lawn. Location, terrain, soil type and condition, age of the lawn, previous lawn care, and other factors affect turf performance. For these reasons, the following management practices can be adjusted to suit your particular home lawn conditions. Mow the lawn with a rotary type mower set to cut at approximately 1 1/2 to 3 inch height. Never remove more than 1/3 of the leaf at any one cutting. Always use a sharp blade. Catch and remove clippings if possible. Spring - When grass begins to green up in spring apply a centipede fertilizer, such as 18-0-18, preferrably containing a weed preventer such as Barricade and iron for deep greening. Broadcast fertilizer using a rotary-type spreader following spreading rates recommended on bag. Summer - In mid-summer apply 18-0-18 again, if necessary. If turf appears yellowed this may indicate chlorosis and an application of iron using a product such as Iron-Plus can help for deep greening. Broadcast fertilizer or iron granules using a rotary-typespreader following spreading rates recommended on bag. Fall - In early to mid fall apply a Fall Feed/Winterizer, such as 5-5-20, preferably containing a weed preventer such as Barricade. Broadcast fertilizer using a rotary-typespreader following spreading rates recommended on bag. Though drought tolerant, Centipedegrass prefers infrequent deep watering. Do not over-water (avoid standing water for any period of time). A gray-green color, footprinting, and wilted, folded, or curled leaves indicate that it is time to water. NOTE: Always water during the early to late morning hours and never at night. Watering at night will often lead to fungal development. Pre-emergence - Apply a granular preemergence herbicide such as Team 2G in early to mid February to prevent the emergence of spring weeds such as crabgrass. Late spring, summer applications of preemergence herbicides may also be applied, and as stated above can be applied in combination with a fertilzer containing a weed preventer. Post-emergence - To kill weeds that have emerged postemergence herbicides can be applied. Atrazine is the herbicide we recoomend for use on Centipede lawns. Apply postemergence herbicides only when weeds are present and make sure to wait until three weeks after the lawn is green. Be sure the product is labeled for use on Centipede and always be careful to follow mixing and applications instructions on product label. Spot treating is recommended. We don't see too many problems with insects on Centipede. If brown spots that are becoming larger begin to appear in your Centipede this could be white grubs. Another insect we see on rare occasion is the spittle bug. Spittle bugs are black in color, triangular in shape, and have bright red stripes on their wings. The Spittle bug gets its name from the spit-like substance it secretes in patches of the lawn. Your local nursery or garden center will carry products for use in controlling these and other pests. Terry O'Leary - Terry has been involved in golf course management since 1996. There isn't much he doesn't know about turf grass.